For clinicians who are serious about validating their OASIS proficiency, the Home Care Clinical Specialist – OASIS (HCS-O) Certification Study Guide, 2019 is your preparatory resource to take the HCS-O Certification Exam. And as a clinician can attest, there is no better way to prepare for a BMSC certification examination than with a BMSC study guide. 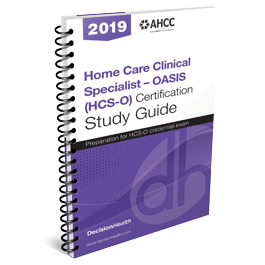 The Home Care Clinical Specialist – OASIS (HCS-O) Certification Study Guide, 2019 takes clinicians through the competencies necessary to master as they prepare for the HCS-O certification exam. It delivers OASIS assessment tips and sample test questions. Practice Questions — Increase your confidence level in taking the exam by testing your knowledge against HCS-O practice scenarios. Exam Outline — Review the concepts that will be tested on your HCS-O exam, and make sure you're familiar with all of the topics outlined. OASIS assessment tips — Get valuable clues to the exam questions. 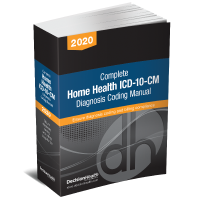 30-Day Money-Back Guarantee: If you do not find that the Home Care Clinical Specialist – OASIS (HCS-O) Certification Study Guide, 2019 helps your clinicians prepare for the HCS-O certification exam, return it within 30 days from receipt for a full refund; no questions asked.